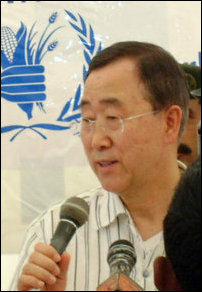 Asserting that the “greatest test of engagement as a policy came earlier this year [with Sri Lanka],” the paper said, “[i]n Sri Lanka, where the government was pushing to crush the ruthless Liberation Tigers of Tamil Eelam, the secretary general reached out to President Mahinda Rajapaksa to persuade him to show restraint to protect the lives of hundreds of thousands of civilians forced to serve as the Tigers' human shields. “In an effort to maintain a cordial working relationship with Rajapaksa, Ban and his top advisers withheld criticism of the government, advising U.N. human rights officials not to publish U.N. estimates of the civilian death toll in the conflict, arguing that they were not convinced of their credibility, according to officials familiar with the discussions. In the end, Ban's diplomatic intervention achieved a brief weekend pause in the fighting but did little to stem to slaughter, which cost the lives of 7,800 to 20,000 civilians,” the paper said, acknowledging tens of thousands may have been killed by the Sri Lanka military. The Post also mentioned contents of Norway's U.N. ambassador, Mona Juul’s, leaked memo, where she said, "spineless and charmless" leader who has failed to convey the U.N.'s "moral voice and authority." Juul, whose husband, Terje Roed-Larsen, serves as one of Ban's Middle East envoys, sharply criticized Ban's handling of the crises in Sri Lanka and Burma in the memo, the paper said, quoting Juul on Ban’s role in Sri Lanka as, "[t]he Secretary-General was a powerless observer to thousands of civilians losing their lives and becoming displaced from their homes. The moral voice and authority of the Secretary-General has been missing." Further spotlighting Ban’s performance in Sri Lanka, the Post said, “Ban and his advisers sought to perform a delicate balancing act. They pressed the country's leader in private to halt the shelling of civilian zones, while avoiding an open confrontation with cautiously worded public statements about the violence. “Human rights advocates faulted Ban for not pressing hard enough to hold Sri Lanka accountable for its actions. Days after the war ended, the secretary general signed a joint agreement with Rajapaksa committing Sri Lanka to pursue political reconciliation with ethnic Tamils and to release hundreds of thousands of displaced ethnic Tamils in government-controlled camps. “In exchange, Ban dropped a U.N. push for an independent investigation into war crimes, leaving it to Sri Lanka to determine whether its military was responsible for the deaths of thousands of civilians in the final offensive. Two days later, Sri Lankan diplomats, citing the agreement, quashed a proposal by the top U.N. human rights official to create an independent commission of inquiry to probe war crimes in the country,” the Post added, exposing Ban’s failure to bring perpetrators of egregious rights crimes to justice. While U.S’s UN Secretary Rice disagreed with Ban’s approach to deal with Burma, U.S. administration has been generally supportive of Ban’s work, the paper said. However, The Post pointed out that “before joining the administration, Samantha Power, the White House's top U.N. specialist, was a sharp critic of Ban's diplomatic style, characterizing his handling of the Darfur crisis as "extremely disappointing. "” Power questioned, "[c]an we afford to do without a global figure, a global leader?" she told the New Statesman, a British magazine, last year, The Post said.